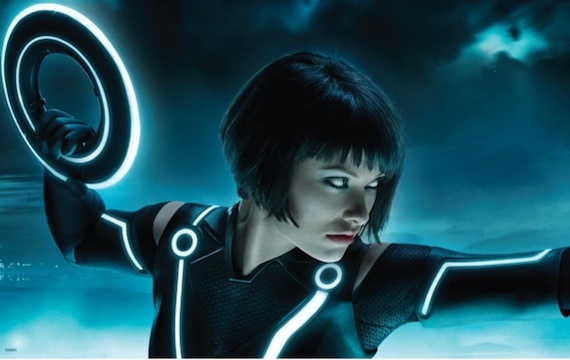 To satisfy every little boy’s and possibly girl’s dream of “wouldn’t it be cool if…” comes the film Tron Legacy. At one point or another, or maybe this applies more to Generations X and Y, the curiosity of what it would be like to be sucked inside a computer, video game or live in a digital battleground has crossed millions of minds, including the film’s star Jeff Bridges who admits taking on the role for these reasons. But Tron Legacy, for as zippy, fun and visually creative as it may be, seems to be a tad more analog than anything else. Nearly three decades after the first Tron film caused financial fiasco for Disney, Tron Legacy returns as a little less of a gamble with a chance to pick up on the 3D dazzling sci-fi business set up by Avatar the same time last year. Tron Legacy’s plot picks up nearly equal to real time, after Flynn has been missing for twelve years leaving his son Sam behind a fortunate and majority share in his ENCOM Company. Since then, Sam has been wreaking small havoc on the company as it abandons his father’s ideals and living low. This all changes when Sam receives a page from his father’s old office that has been shut down for years. In the abandoned office Sam finds his father’s legacy, a portal into the Gird, the electro world his father had been creating and was imprisoned in for years, or millenniums depending on whose watch you are going by. In the Grid, Sam encounters a foreign cyberworld where he must ride and fight to survive and free his father from his clone-gone-crazy, Clu. Please put on your 3D glasses for the rest of the review. If it any point it seems like it’s a borrowed plot from science fiction before it, it is because it is and scenes and other elements from the film will help remind audiences of that. But Tron Legacy never aims to be anything revolutionary and that’s alright. Where it seeks to awe and please is through its stunning visual sequences that will indeed take audiences for ride. Battle scenes and races are superb and are match made in digital heaven with Daft Punk’s Hans Zimmer flavored score. Throw in an effortless and veteran performance by Jeff Bridges doing his Zen thing and a rapacious David Bowie-esque performance by Michael Sheen, and the film is never really strenuous to watch. As Sam fights off programs in a Gladiator like arena using a round, Frisbee like disc placed on his back that serves as a personal hard drive, some thoughtfulness is evoked. Perhaps one day wars or violence over flashdrives or digital information will exist, just look at the recent WikiLeaks controversy. Unfortunately Tron Legacy zooms past any chance for being smart or insightful. Sure some chatter ensues about philosophy, unattainable perfection and free information, but that isn’t really a concern to filmmakers, especially first time film director and videogame commercial director Joseph Kosinski. Sure, Tron Legacy is a marvel creation in terms of visual effects and art direction, maybe even some other technical fields, but nothing in comparison to Star Trek. Without any substance to the story, any larger metaphors that make science fiction movies so otherworldly, the film ends up losing a lot of its flash. This entry was posted in Reviews and tagged 3D, Avatar, Daft Punk score, Disney, Jeff Bridges, Joseph Kosinski, Movie reviews, Sci-Fi Films, Sequel, Special Effects, the Grid, Tron, Tron Legacy by LukeMiller. Bookmark the permalink. Nice review and I agree with your assessment. I kept wishing what a pity that the script is inept, it could’ve been a classic given the stellar visuals.